go to our Facebook page (Click Here) or call the track hotline (217) 345-7777. No limitations on tire, nitrous, turbo or blowers, but must adhere to all NHRA Rules. Please Visit Our Sponsors Page Support Those Who Support Us! Test-N-Tune and Gamblers Grudge. Running will be Gamblers Box, No-Box Pro (NBP), Footbrake (FB), Clinton All Out (CAO), Novice Street (NS), Jr's and Test-n-Tune (TnT). 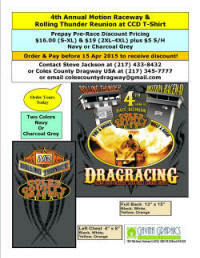 Thanks to Schaeffer's Racing Products; Best Reaction Time 1st round will receive a $10 credit towards any Schaeffer's Racing Product we stock. Entry: Box $50 / No-Box Pro $40 / Footbrake $30 / Novice $20 / Jr. Street $20 / Jr's $20 / Test-n-Tune $30 / Racers Fee $5. Spectators (Adults) $10 and 12 & under Free. Anytime we have an Official Race Program or TnT on our schedule we prep the track with VHT. Remember camping is always free. While our delivery method has changed you can be assured we will have racing fuel available on site. No longer will we be selling it by the gallon, but we will be selling it in a 5 gal can or 55 gal drums. On site we will stock Sunoco Leaded 110, 112, HRC Plus 114 and Methanol. We will also be able to get E85, Maximal (116) and 260GTX (98 Unleaded). 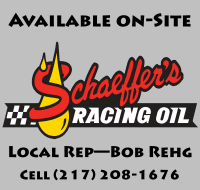 We are excited to announce Schaeffer's Racing Oil & Specialty Lubricants will be available On-Site. and we're looking forward to an even better 2019. The 2018 Racing season has come to an end with many racers & crew members working hard all season for a Track Championship, but only one can be Track Class Champion. The 2017 Racing season had come to an end with many racers & crew members who've worked all season for a Track Championship, but only one can be Track Class Champion. Congratulations to the following 2017 Track Champions. The 2016 Racing season is coming to an end with many racers & crew members who've worked all season for a Track Championship, but only one can be Track Class Champion. Congratulations to the following 2016 Track Champions. Ellis Buth of Warrensburg, IL came out mainly for the $2K Hole in the Wall BBQ Pro and decided at the last minute to bring his trusty 96 F150 Ford Work/Race Truck to run Sportsman. It turned out to be a good idea as he took home the win in Sportsman and the run off for the NHRA Member Track Madness Trophy. In the run off Ellis beat Jesse Fink of Ivesdale, IL on his 02 Suzuki. Jesse had been killing the tree and running the number all day, but had some issue shifting into 2nd; giving Ellis the Semi-Final win. Joel Leihser in his 69 Firebird from Decatur, IL took on Matt Chaney in his 90 S10. Joel had the better reaction time and took just enough stripe for the win. The finals pitted Ellis & Joel with Joel having the better reaction time, but Ellis ran dead on with an "0" giving him the better package & win. The NHRA National Dragster Challenge was contested at Coles County Dragway USA on 10 Sept with the covenant NHRA "Wally" on the line in Super Pro, Pro and Sportsman. Mother nature hasn't been very kind to CCD with race day morning clouds & rain looking like every other big race day cancellation this year, but by 11 am the clouds started to dissipate making for an absolutely beautiful Saturday night of racing action. Denny Katz of Mattoon, IL had a career day in his 03 Chaney Dragster taking home his first "Wally". Wes had kept 7.25 on his window all day long repeatedly running the number, but in the finals Doug Herman of Decatur, IL in his 70 Nova left too early and Wes didn’t need to run the number to take home the win. Rob Fisher of Humboldt, IL wheeled his 65 Chevelle Wagon to the O'Reilly's Winners Circle in Pro beating Ron Hill of Villa Grove, IL in his 75 Dart. Both drivers ran on their dial and near identical reaction times, but Rob's was .004 closer to his dial-in giving Rob the Win and Wally. Katrina Shain of Sullivan IL driving her 79 Camaro has been creeping closer to the winners circle each week and finally sealed the deal with her first ever Win & Wally as she beat Brad Talbert of Mattoon, IL in his 81 Malibu. 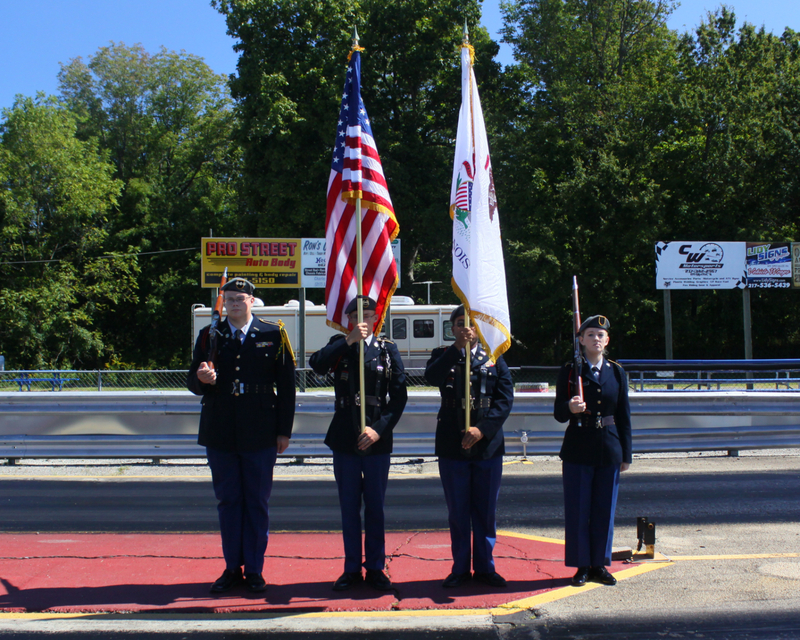 Special thanks to the Mattoon High School ROTC for presenting "Colors" during the 9/11 Remembrance Ceremony. Wow, what an incredible night of racing action we had for Thunder on the Prairie from the Wheel Stander to some of the baddest Hot Rods around competing in the JT Muffler Q330'' to the stout field of 56 Pro cars to a record spectator count. We'd like to thank all the fans & racers who stayed with us waiting so patiently as we worked to get the racing action in. We rolled 136 cars through the lanes and couldn't of done it without our unbelievable staff. Too boot we got it all in with 2 minutes to spare on the curfew and it was great to see so many fans stay to the end. The first NO Prep Heads Up race on 25 June was a huge success. We had a great turnout of racers & spectators along with some very tight racing. Several Racers ran dead on their index and the finals in both Index classes had the nearest margin of victories. We can't thank Kevin Hunt (Kevin Hunt Dragin Dart Racing & Video), Joe Laramee (Decatur Gold & Coin) and Steve Moberly (Scram Speed) for all their help and sponsorship. 2016 NHRA Coles County Dragway USA "King of the Track"
Tom Walters of Monticello, IL has been racing on/off for 25 years and just last year picked the sport back up. Tom started his racing career in the early 80’s pit crewing for Paul Nickell at Motion Raceway and started racing himself in the 90’s, but had to stop too raise a family. Fast-forward to 2015 and Tom finally had the time & dollars to get back into racing and has been doing well since. Saturday night at CCD Tom took home his first win and to top it off it was a NHRA “King of the Track” Wally race which earned him his 1st Wally also. Tom bought his 81 Regal from long-time friend Frank Butler 4 years ago and dedicated this win to him with special thanks to Cory & Wes Butler for helping out. In the NHRA King of the Track run off Tom beat Walt Edwards of Charleston, IL in his 02 Dragster. Walt had been killing the tree and running the number all day, but had some issue staging; flickering the tree and once the computer caught him in the car backed out of the lights giving the win to Tom Walters. Thanks to all the racers and spectators for supporting this race. It was an unbelievable turnout as 62 racers went for the win with Terry Willard of Mattoon IL taking the home the win. We are pleased to announce our continued partnership with Snearly Racing Transmissions for the 2016 Racing Season. Wayne Snearly will once again be giving away a SRT Powerglide Transmission to one lucky winner at the 2016 Racers Banquet held in January 2017. Any racer earning at least 55 points under the new "KoT" points system before 27 September 2015 will be entered into a drawing for a Powerglide Transmission built by Snearly Racing Transmission of Bethany, IL. This transmission will be drawn for at the 2016 Racers banquet and you must be present at the time of the drawing to win. Hall of Fame Pages are accessible on our "Hall of Fame" page. Anyone with information or old pictures please email us. There will be three new classes for the "Street Racer" to include Door Car Heads Up Run What ya Brung, 7.35 True Street Index and 8.0 Street Freak to be run on select Friday Nights (20 May, 24 Jun, 22 Jul & 26 Aug). Monthly Winner receives "King of the Street Trophy"
Only rule to follow will be follow NHRA Rules for Safety & ET, so anyone with a Street Car can enter. It will be run on a 7.35 Index with a .500 Pro Tree. Cost will be $10 at the gate per person & $15 to enter 7.35 True Street Index. Regular Friday Fun Night open time runs for everyone until 8 pm and then 1st round of eliminations at 8 pm with random pairing. Once you've been eliminated from competition you can continue open time runs until we close. Thanks to Kevin Hunt's Dragindart Racing & Video we're excited to announce 8.0 Street Freak will run on select Friday's during the 2016 Season. 8.0 Street Freak will guarantee $100 & Trophy to Win & $40 for R/Up each race thanks to Kevin Hunt's Dragindart Racing & Video. There will be very few rules so anyone with a Street Car can enter. It will be run on a 8.00 Index with a .500 Pro Tree. Cost will be $10 at the gate per person & $15 to enter 8.0 Street Freak. Regular Friday Fun Night open time runs for everyone until 8 pm and then 1st round of eliminations at 8 pm with random pairing. Once you've been eliminated from competition you can continue open time runs until we close. 1) Cars or trucks must be street legal with current tags and insurance. 2) Must have mufflers on vehicle (not in the trunk) open dumps allowed. 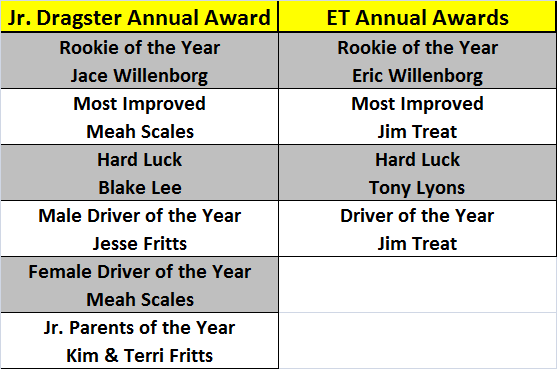 The 2015 Racing season has come to an end with many racers & crew members who've worked all season for a Track Championship, but only one can be Track Class Champion. 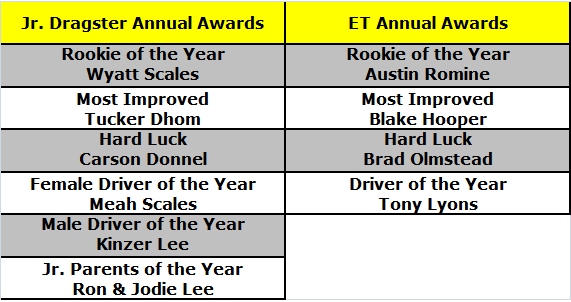 Congratulations to the following 2015 Track Champions. 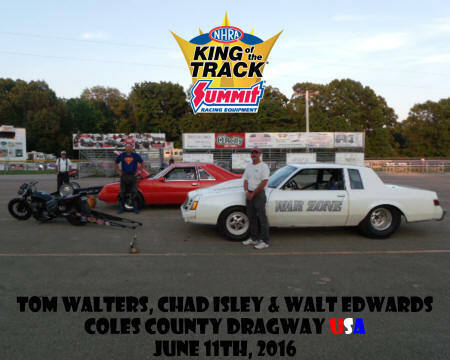 Congratulations to Terry Willard on his King of the Track Combo "Wally" win. 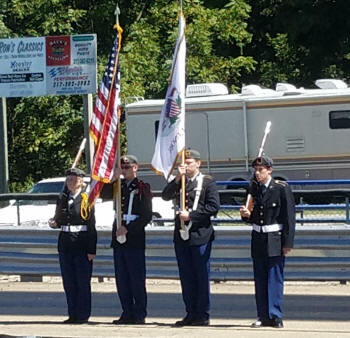 The NHRA Illinois State Championships was contested at Coles County Dragway USA on 27 Sept with the covenant NHRA "Wally" Plaques on the line in S/P, Pro, Sportsman, S/P Bike, High School & Jr's. Mother Nature sure seems to given CCD many scares this year and this weekend was no different. With clouds looming all day a sense of urgency was in the air, but that didn't seem to bother the race winners. In S/P Randy Protz of Vandalia, IL in his 74 Vega Wagon only blemish was his "Red" light in the first round, but he bought back and marched through field before meeting up with Geramie Edwards of Mattoon, IL in his 99 Dragster in the Finals. Geramie had the starting line advantage, but Randy ran dead-on with an "zero" giving him the win with John Moy & Wes Butler semi-finalist. Pro saw many time winner Tony Lyons of Ashkum, IL in his 89 Probe taking on first time "Finalist" Stuart Galloway of Milford, IL in his 85 Monte Carlo LS. Tony had a slightly better reaction time and ran closer to his dial as Stuart went too fast breaking out giving Tony the win with Tom Harlin the lone semi-Finalist. Sportsman had two drivers who'd never won a "Wally" with David Lewis of Farina, IL in his 86 Cutlass beating Scott Pickens of Marshall, IL in his 85 Monte Carlo SS with Jed Veach the lone semi-finalist. Ken Walker of Kansas, IL riding his 77 Kawasaki took out "Fast" Freddy Hollingsworth of Champaign, IL on his 93 Suzuki. Neither rider want the race off the starting line, but Ken ran closer to his dial giving him the win. High School category had its biggest car count of the year with John Vice of Paris, IL in his 70 Camaro beating Dalton English of Metcalf, IL in his 74 Duster. John was better on the tree and ran closer to his dial in taking home the victory. In Jr. Dragster Christopher Mullins of Lincoln, IL, running in his last chance at a State Championship as he will outage the class next year took on Kinzer Lee of Kansas, IL one of the younger Jr. Racers. IT was a close battle, but Christopher nailed the tree and took home the win. The NHRA National Dragster Challenge was contested at Coles County Dragway USA on 12 Sept with the covenant NHRA "Wally" on the line in Super Pro, Pro and Sportsman. Mother nature hasn't been very kind to CCD with race day morning clouds & rain looking like every other big race day cancellation this year, but by 2 pm the clouds started to dissipate making for an absolutely beautiful Saturday night of racing action. Wes Butler of Bement, IL has been fighting every issue possible, but it all came together Saturday night as he took the win in his 81 Buick Regal taking home his first "Wally". 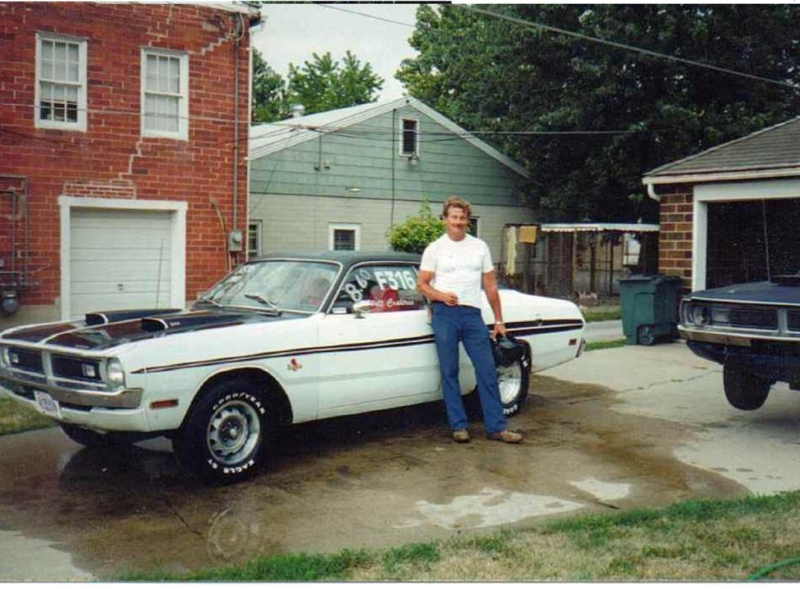 Wes had kept 7.25 on his window all day long repeatedly running the number, but in the finals Doug Herman of Decatur, IL in his 70 Nova left too early and Wes didn’t need to run the number to take home the win. Eric Rayburn of Philo, IL wheeled his 69 Nova to the O'Reilly's Winners Circle in Pro beating Ralph Craig of Charleston, IL in his 76 Firebird. 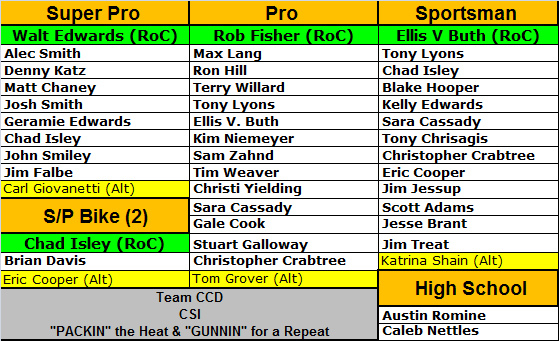 Both drivers ran dead on their dial and near identical reaction times, but Eric’s dead-on with a 6 was closer than Ralphs dead-on with a 9 giving Eric the Win and Wally. Chad Isley of Charleston, IL driving his 87 Mustang has been on a terror this year with 9 wins alone in Sportsman along with 4 wins in Pro and 2 wins in S/P Bike and took home his 17th Wally and 2nd of the year at Coles County Dragway USA as he beat Christi Yielding of Humboldt, IL in her 81 Malibu affectionately known as the "Cash Cab" from its bright Yellow paint and Cash she's been winning with it. Christi was the only racer left in two classes in the Semis of Pro & Sportsman and had taken out two National Champions, 1 Division 3 Champion and 2 Track Champions on her way to the finals where Chad beat her on the tree and closer to his dial forcing Christi into taking the stripe, but breaking out. Tell you friends and fellow racers about this and help CCD continue to grow. We'll still use the tiered system for R/Up, Semi-Final and Quarter-Finals payouts. Due to the outstanding car counts and curfew (11:30 pm) we will no longer be able to have the later start time. For the remainder of the year; Gates will open at Noon and Time Runs will Start at 2 pm. The Outlaw Automotive & Performance Heads Up Door Car Shootout had some of the Fastest Street Door Cars converge on Coles County Dragway USA. 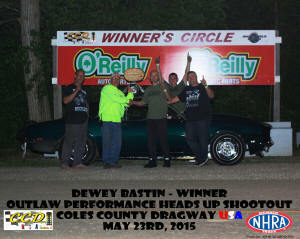 Dewey Bastin in his Bastin & Stark 1968 Camaro from Indianapolis, IN took home the win beating Cade Spires of Clinton, IN. It was a tight battle to half track before Spires fuel management system failed causing him to lose power as Bastin pulled away for a best ET of 5.698 at 128.21 mph. Order your pre-sale shirts now at a discount price. Pre-sale prices are $16 (S-XL) & $19 (2XL-4XL) and are available in Navy or Charcoal Grey. What an incredible night we had from the record car count and spectator count, it was awesome to see the house packed. We'd like to thank all the Spectators and Racers who came out to enjoy the night and especially to the Exhibition Racers who kept the spectators on the edge of their seat. It was great meeting a lot of you and hearing all the stories of times past. CCD would like to thank the Motion Raceway Committee for allowing us to have the Motion Raceway Reunion and a special thanks to Kevin Hunt for all his help preparing & promoting this event. Wow, what an incredible night of racing action we had for Thunder on the Prairie from the Jet Funny Car, to a little Mother Nature raining on our parade, to some extremely tight bracket racing and a super fast Q330'. We'd like to thank all the fans & racers who stayed with us waiting so patiently as we worked to get the track dry and our unbelievable staff that worked so hard to keep the show rolling for you as we couldn't do it without all of you. It may of been late when we got done, but it was great to see so many fans stay to the end. Eric Cooper caps the weekend off with the "King of the Track" title and another Wally. 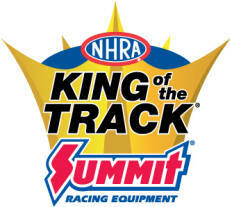 This years NHRA "King of the Track" racers were, Jason McConnell (Super Pro) 11' Millennium Dragster, Humbolt, IL, Terry Willard (Pro) 78 Camaro, Mattoon, IL, Rob Fisher (Sportsman), 83 Malibu Wagon, Humbolt, IL & Eric Cooper (Bike) 77 Kawasaki, Martinsville, IL. Racers drew for the opponents and in the semi-finals it was Eric Cooper defeating Terry Willard in a race that was decided on the starting line with Terry's Red Light. In the second semi-final it was Jason McConnell defeating Rob Fisher as Rob's starting line advantage wasn't enough as Jason closer to his dial giving him the win. In the finals Eric Cooper took home this year's NHRA "King of the Track" Wally over Jason McConnell. Eric with the slower dial-in, left first, was having problems down track with his bike not realizing Jason had gone "Red" giving him the automatic win and a trip to the "O'Reilly's" Winners Circle. The 2014 1st Annual Midwest Bottom Bulb Challenge brought to you by Cedar City Motors. Andy Romine of Tuscola, IL driving his 89 S-10 took home the win both days as he dominated the field of 64 cars Saturday Night with racers from 4 states competing for the $4K to win. In the Semi-Finals Joel Leihser of Decatur, IL in his “BADPON” 68 Firebird was the only person who carried his double entry down to 16 cars earning two checks, had a shifter issue and lost to event winner Andy Romine. Romine had stated earlier that he had a lot of lucky rounds over the night and this was just one of those as Joel had drilled Andy on the starting line, but Joel’s shifter malfunction giving Andy the win. In the other Semi-Final Tim Walters of Indianapolis, IN in his 73 Camaro took on Tony Lyons of Ashkum, IL in his 89 Probe. Tony had the starting line advantage taking that to the finish line for the win. In the finals Tony had a .054 starting line advantage in another one of those as Andy would say “Had a few lucky rounds today” as Tony would take the stripe, but breakout giving Andy Romine the win. Andy stated "I would like to thank my dad, Allen Romine, for what he does to keep our race cars competitive. This time of year gets pretty hectic as I coach boys track as part of my job, and we are nearing the postseason. My dad really does a lot to help me stay on top of maintaining my race cars. If there was a hall of fame of fathers, he'd be enshrined on the 1st ballot. Also, a big thanks to Larry Hodge of Larry Hodge Racing Tires. He sent me two pairs of tires to try this week. His knowledge of tires, and the game of bracket racing in general, is immense, and I am thankful he is welling to share some of that knowledge. He runs a great business that is racer friendly. Finally to Battery Specialists of Charleston for getting an alternator repaired for my race car in a timely fashion so it was ready for this weekend. Lastly, to Walt and Kelly Edwards of Cedar City Motors, for helping to put on a great event. This was the largest payout to my knowledge, at this track, in about 16 or 17 years and their sponsorship was a huge reason." Saturday’s Box final had Ron Zinn of Shelbyville, IL in his 79 Mustang taking on Jim Falbe of Clinton, IL in his 68 “DartZaster” Dart. Jim had a perfect light earning him 5 free wings courtesy of Buffalo Wild Wings of Mattoon in their “.500 - 5 Free Wings” program at CCD while Ron ran 7.257 on his 7.26 dial-in, too fast, giving Jim the win. On Sunday it was Andy Romine and Brad Talbert of Mattoon, IL in his 89 Malibu in the Finals. Once again it was Andy day’s as Brad had a near perfect reaction time (.508) and broke out by 1 thousand (.001) 7.329 on a 7.33 dial-in. Semi-Finalist were Harold Wright of Ashmore, IL in his 87 S-10 and Chad Guffey of Nashville, IN in his 67 Camaro. In the Box Final it was Matt Chaney of Mattoon, IL in his 87 S-10 taking on Kassie Edwards-Wilson of Charleston, IL in her 99 Camaro. Matt took his starting line advantage all the way to the bank as he took home his 3rd win of the young 2014 season. Their Hall of Fame Pages are under construction and will be accessible on our "Hall of Fame". Anyone with information or old pictures please email us. Several students representing Lake Land College, Parkland College and SIUC Automotive Technology converged on CCD this past weekend for the covenant "King of the College" Perpetual Cup. 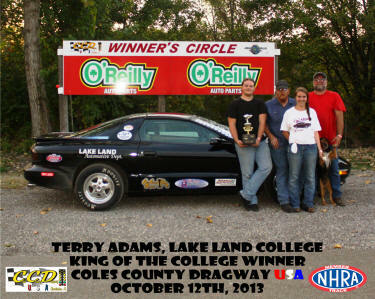 Taking home the crown this year was Lake Land College with Terry Adams behind the wheel of the Schools 1998 Firebird sponsored by Advanced Auto Parts, Central Illinois Transmission, Lake Land Automotive Club & Scott Shop. Thanks to Lake Land College for providing food for everyone. If you have an Android Phone and would like to stay up to date with what's happening at CCD, thanks to Warren Evans there is now an App that can be found on the Android Market (Search "CCDLINK "), http://waterboxlabs.com/ or email us at (Click Here). For those with iPhone and iPads your App is being tested by Apple now and should be released to your market soon. Check our website for updates. Maybe you forgot to bring enough fuel or just want the convenience of getting it at the track. On site we always have Sunoco Racing 110 Standard Fuel and Methanol we sell by the 5 gal can or 54 gal drum. We can get by the 55 gallon drum: Supreme 112 octane, Unleaded 260GT 110 octane (w/10% Ethanol) and Unleaded 260GTX 98 octane. If you need pricing please call 217-512-0673 as fuel prices do fluctuate regularly. Question: Can I run my exhaust through the front corners of my driver’s compartment then to the outside of the car?